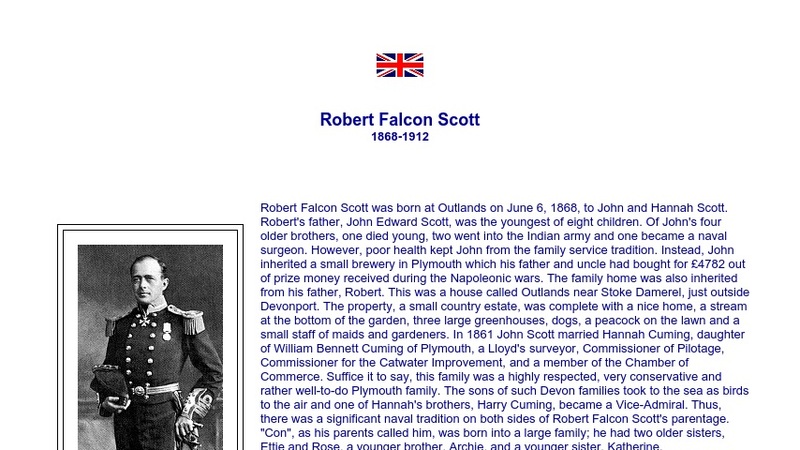 Robert Falcon Scott, one of the earliest explorers of the McMurdo region of Antarctica, is featured in this website. The site contains an overview of Scott's life including information on the Discovery and TERRA NOVA expeditions and links to other Antarctic explorers. The site also includes links to Arctic and Antarctic exploration timelines, the South-Pole home page, a site dedicated to explorers of the poles and the surrounding islands, and information on Arctic and Antarctic philately.